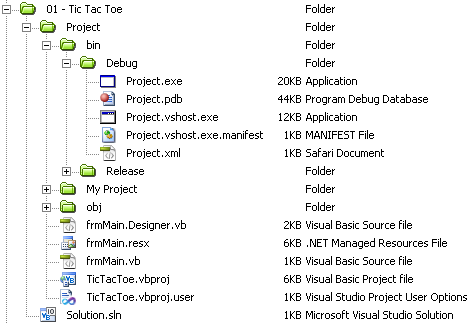 The file and folder structure found inside a single VB.NET project can at first appear pretty overwhelming and so it’s probably worth us pausing for a moment to make some sense of all that stuff! This one we are already somewhat familiar with. It is the one that refers to your project as a whole and so whenever you’re opening your project, it is the one you should open. Any “.vb” file you see is a form within your project. We currently only have one form but you could have more if you want. A form is where you draw your program and it also holds all the code for your project. If there was one file (or set of files) you should always keep track of and back up, it would be your “.vb” file/s! When you run your program from within the IDE, it creates an executable file called “Project.exe”. This file is your standalone copy of your program…you could take that file and run it on any modern Windows machine and you should be able to see your program. And that’s it!!! All those other files are needed by VB.NET but we don’t need to stress about them. Simply allow VB.NET to keep the files and folders it wants and we’ll just keep track of the three files listed above. FINALLY, it’s time to do something in VB.NET!